Home / Unlabelled / CAN EL-KANEMI WARRIORS OF MAIDUGURI LEAVE THE UNDERDOG ZONE OF THE NPFL IN 2018? CAN EL-KANEMI WARRIORS OF MAIDUGURI LEAVE THE UNDERDOG ZONE OF THE NPFL IN 2018? The Maiduguri based team did not look like a title contender in the last four seasons but one thing is certain about them, they have shown growth and consistency. After returning back to the elite league in 2012, they were faced by the aftermath of the ravaging Boko Haram insurgency which moved them out of their home to another man's land. In 2014, El-Kanemi warriors played all their home matches in Kano then from 2015 to 2016 they hosted every other NPFL teams at the Muhammad Dikko stadium of Katsina. In the last two seasons the team managed to end the league staying in the top half of the table(9th in 2016 and 6th in 2017). In 2015, they finished in the thirteenth position. This result isn't to bad for a team whose main sponsor is battling terrorism. The former coach of Enugu Rangers Imama Amapakabo was signed last October one a season long contract to handle the team while they play from their own base, El-Kanemi stadium Maiduguri. 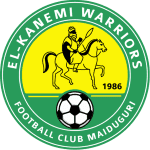 El Kanemi warriors was founded in 1986 and their home stadium is reputed to be of 10,000 sitting capacity.